Blue Velvet remains one of my favorite of David Lynch's films. It seems to embody everything that informs his artistic interests: fetishizing 50's American nostalgia while also revealing it to be a fallacy, playing with noir tropes and delving into pure madness. Dennis Hopper's Frank Booth is still an unparalleled monster, Isabella Rossellini the perfect fatale, while Kyle MacLachlan, and Laura Dern inform the film's transgressive loss of innocence. 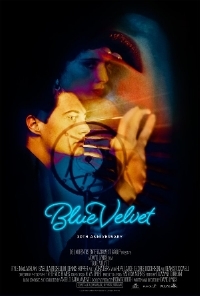 The newly restored Blue Velvet opens at Film Forum in New York City on March 25th and will travel across the country. And as a special bonus, watch Lynch explain "New Wave" in the trailer for Cinefamily's upcoming program, Underground USA: Indie Cinema of the 80s.